El jefe del Comando Sur de las Fuerzas Armadas de Estados Unidos, almirante Craig Faller, se reunió este lunes en Brasilia con el canciller brasileño, Ernesto Araújo, para discutir cooperación en asuntos de defensa y seguridad, se informó oficialmente. O ministro @ernestofaraujo reuniu-se hoje de manhã, em Brasília, com o almirante Craig Faller, chefe do Comando Sul dos Estados Unidos, para discutir a cooperação e as parcerias bilaterais na área de defesa e segurança. El jefe del comando sur estadounidense visitará una de las joyas del desarrollo militar braisleño, la base naval de submarinos de Itaguaí, estado de Río de Janeiro, donde se construye un submarino a propulsión nuclear con tecnología francesa. O @Southcom é responsável por fornecer planejamento de contingência, operações e cooperação de segurança em sua área de responsabilidade designada, que inclui: América Central, América do Sul e Caribe (exceto comunidades, territórios e possessões dos EUA). On February 10-13, U.S. Navy Admiral Craig Faller, Commander of U.S. Southern Command (SOUTHCOM), is visiting Brasília and Rio de Janeiro and meeting with civilian and military leaders in order to discuss bilateral security cooperation with Brazilian counterparts in support of regional peace and Western Hemisphere stability. Brazil and the United States, the two most populous democracies in the Western Hemisphere, enjoy an increasingly close bilateral relationship, including increasingly in the area of defense, on specific areas such as research and development, information exchanges, training and education, joint military exercises, and commercial initiatives related to defense matters. Today in Brasilia, Admiral Faller is visiting with Minister of Foreign Affairs, Ernesto Araújo, the Chief of Defense, Lieutenant-Brigadier Raul Botelho, the Navy Commander, Admiral Ilques Barbosa Junior, the Air Force Commander, Lieutenant-Brigadier Antonio Carlos Moretti Bermudez, and visit the Aerospace Operations Command (COMAE). In addition, he is meeting with Chargé d’Affaires William Popp and other personnel at the U.S. Embassy in Brasilia. In Rio de Janeiro, he will meet with Army Commander, General Leal Pujol, visit the Airborne Brigade at Vila Militar, tour the Multi-purpose Helicopter Carrier, Atlântico, and also visit the Itaguai Submarine Base. 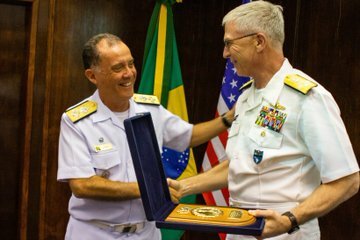 The Admiral’s visit to Brazil follows earlier visits to the South American nation by Vice President Mike Pence, former Secretary of Defense James Mattis, and Secretary of State Mike Pompeo, and reflects the longstanding and close military ties between the hemisphere’s two largest democracies. Admiral Faller will be accompanied by former Ambassador to Brazil Liliana Ayalde, currently serving as the Civilian Deputy and Policy Advisor to the Commander. U.S. Navy Admiral Faller assumed command of SOUTHCOM on November 26, 2018, and is responsible for all Department of Defense security cooperation in the 45 nations and territories of Central and South America and the Caribbean Sea. In his first 90 days as SOUTHCOM commander, he has visited Colombia, El Salvador, Guatemala, Honduras as well as Trinidad and Tobago to hear partner-nation perspectives, concerns and ideas, and express the command’s unwavering commitment to its enduring partnerships with military and public security forces in the region.